The question I want to ask is related to the answer of this question: biblatex: filter out publications from a specific author in the references dynamically . My aim is to separate my bibliography into two parts : one part for a personnal bibliography, and a second one for the regular bibliography. The problem is that only the second bibliography appears, and when I remove the refsection, then all the bibtex entries of my input files are printed, separated as they should. 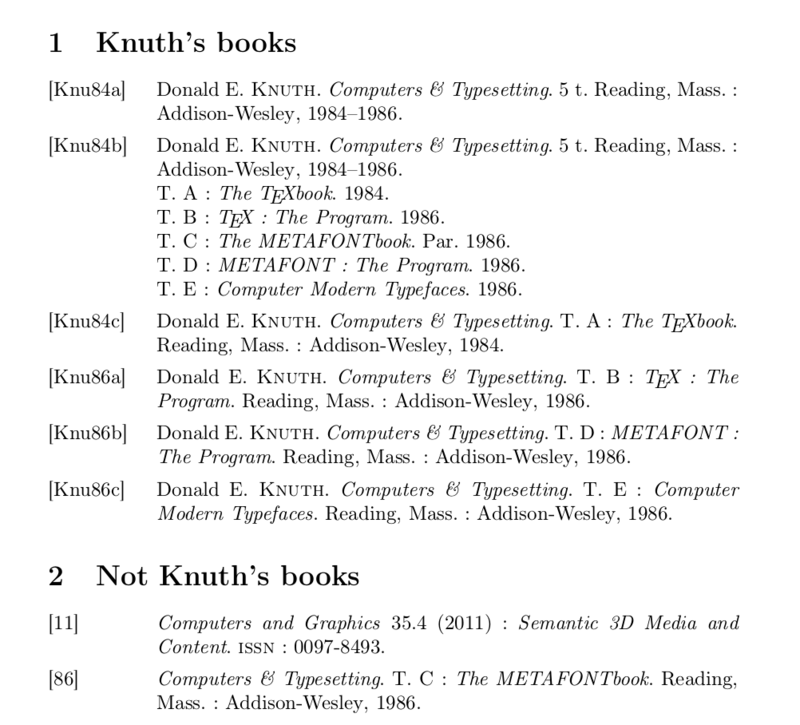 EDIT: the aim is to have all publications (even the ones not cited) by author knuth in the first section and all the other cited publications in the second one. Here a small modification of your example. The example works only with backend=biber. Not the answer you're looking for? Browse other questions tagged biblatex subdividing or ask your own question. How to force Latex print out reference items from Bibtex file? How to print a bibliography for a particular author only?